A watershed is the upslope area that contributes flow—generally water—to a common outlet as concentrated drainage. It can be part of a larger watershed and can also contain smaller watersheds, called subbasins. The boundaries between watersheds are termed drainage divides. The outlet, or pour point, is the point on the surface at which water flows out of an area. It is the lowest point along the boundary of a watershed. 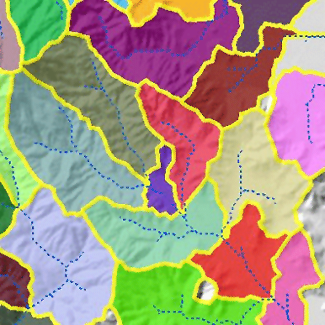 Watersheds can be delineated from a DEM by computing the flow direction and using it in the Watershed tool. To determine the contributing area, a raster representing the direction of flow must first be created with the Flow Direction tool. You will then need to provide the locations you wish to determine the catchment area for. Source locations may be features, such as dams or stream gauges, for which you want to determine characteristics of the contributing area. You can also use a flow accumulation threshold. When the threshold is used to define a watershed, the pour points for the watershed will be the junctions of a stream network derived from flow accumulation. Therefore, a flow accumulation raster must be specified as well as the minimum number of cells that constitute a stream (the threshold value). The output is a raster of the watersheds.